Bamboo sets are warmed or at room temperature and applied to the body along with oil, helping the bamboo tools to glide and give a deeply relaxing treatment. The history of bamboo massage is not very well known, but it is believed to have started in South East Asia by a resourceful spa therapist. 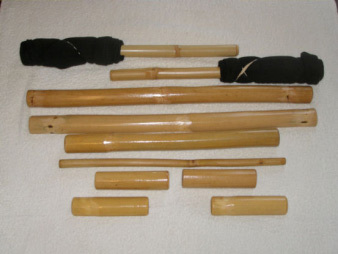 The technique of using bamboo for therapy is relatively new. 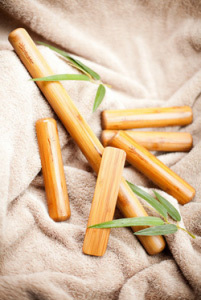 Gently heated/ or room temperature pieces of smooth bamboo are used for rolling out tension. This soothing movement triggers the body's automatic relaxation response, making it easier to access those areas of underlying tension. A combination of heat and just-the-right-amount-of-pressure helps to melt the tension held by overstressed muscles. As both the mind and body relax, the result is a sensation of inner calm and well-being. For further details about Bamboo Treatments Contact Us.